ALBUQUERQUE, N.M. (AP) Makuach Maluach's only basket Wednesday night, coming with 1:27 left, was enough to give New Mexico a 73-72 win over Boise State. Malauch's 3-pointer followed one by the Broncos' Justinian Jessup with 1:51 left. Corey Manigault scored 19 points, including 10 in the first seven minutes of the second half, to help the Lobos (13-16, 7-10 Mountain West Conference) hold off a Boise State surge (11-19, 6-11). Jessup and Derrick Alston led the Broncos with 23 points apiece. Still, it took Boise State nearly 10 minutes of the second half to erase the Lobos' 41-29 halftime lead, using a 11-0 run that Pat Dembley capped with an end-to-end drive to tie it at 53. The game was tied three times with four lead changes in the closing minutes. Neither team had a lead larger than four points over the last 10 minutes. After Maluach's shot, Jessup missed a layup in the paint with just over a minute left. New Mexico had several shots go awry in the final minute as well, but Carlton Bragg went to the line with 8.2 seconds left with a chance to give the Lobos a 3-point advantage but he missed both shots. 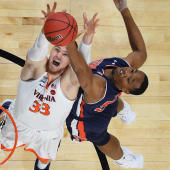 The Broncos rushed the ball up the court and just as Alex Hobbs prepared to pass it inside, Dane Kuiper snuck around from behind for the game-sealing steal. It was fitting that Kuiper, who was added to shore up the defense late, came up with the big play at the end, New Mexico coach Paul Weir said. Boise State came into the game on a freefall, losing five straight. Two of those were in overtime and another was by a bucket. Boise State, which equaled a program record for losses in a season, is 1-9 in games decided by two points or less, or in overtime. New Mexico had not been much better, losing seven of 10, but this win will give the Lobos the seeding advantage if the teams should happen to tie following their final games Saturday. New Mexico finishes up the regular season Saturday at Wyoming, which has just two conference wins on the season. Boise State is home against Air Force on Saturday.